Women Who Code - Enova International, Inc.
We are pleased to announce another meetup in partnership with Women Who Code on August 24th at Enova’s headquarters! You, along with your friends and co-workers, are invited to this awesome event. Enova has hosted many successful meetups in the past on “Learning Ruby/Code with Ruby.” However, for the very first time, we are hosting a meetup on writing tests in Ruby! 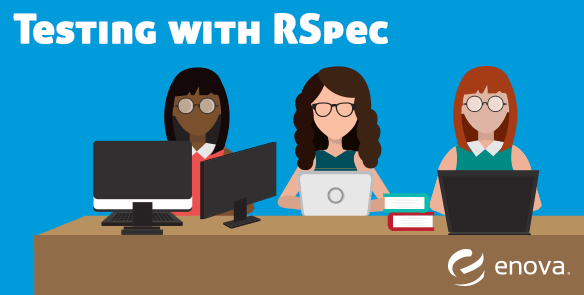 We are calling it “Testing with Rspec.” RSpec is a behavior driven development (BDD) framework for Ruby that has its own mocking framework and one of the best testing libraries. The format of our meetups is very informal and relaxed, which will give you an opportunity to work and collaborate with other attendees, ask others for help and offer assistance. In addition to the networking opportunities with your peers, you will also have access to individuals who you can turn to for sustainable ideas and strategic insight. At the meetup, you will have freedom to approach Enova volunteers to discuss any of your current challenges and roadblocks. Throughout the event, you can expect to learn about importance of testing, the role of a Test Engineer at Enova and how to apply the knowledge to work on real world issues. If you would like to learn more, don’t forget to sign up at http://bit.ly/1JOCijY. We hope to see you there!